Looking at the whole of 2017, there were some interesting shifts on what phishing emails were clicked from quarter to quarter. Usually there was a stand out for every quarter. Over the course of the year, the top email templates clicked shifted each quarter for the general categories. 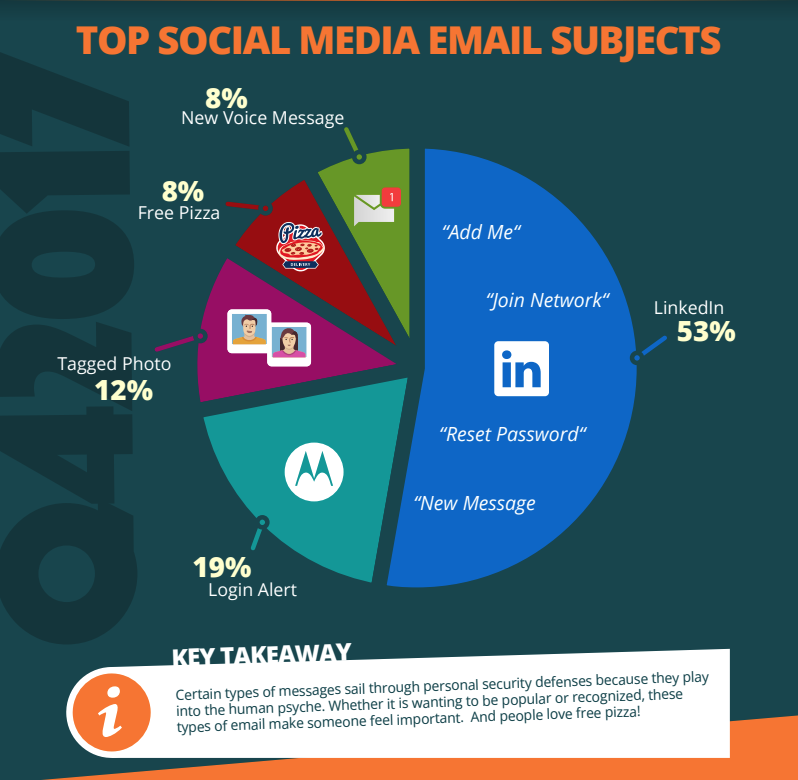 The emphasis/most clicked at the beginning of the year in Q1 was on email and account updates. The volume grew by nearly 50% the second quarter with the emphasis shifting to password changes and security alerts. Third quarter saw a slight decline of top 10 clicks by about 13% with the emphasis shifting to HR and health care. And the fourth quarter saw a definite seasonal shift with 34% of templates clicked related to packages. Social templates clicked remained relatively consistent with LinkedIn a clear stand out and jumping considerably up for Q4. This is typically when people wait to change jobs but start looking for jobs and connections as well. The main take-away after looking through the data is that people are *really* predictable. Basic curiosity: new contact request, new email, new file, you've been tagged in a photo, etc. Organizations wanting to phish their employees can pull any of these levers and know that they are emulating the basic drivers can cause a "knee-jerk click" reaction for phish prone employees. Similarly, criminals *already know* that these types of subjects will find the softest of targets and serve as an effective vector into an organization. Did you know that 91% of successful data breaches started with a spear-phishing attack? Cyber-attacks are rapidly getting more sophisticated. We help you train your employees to better manage the urgent IT security problems of social engineering, spear-phishing and ransomware attacks. Take the first step now. Find out what percentage of your employees are Phish-prone™ with our free test. Did you know that KnowBe4 also supports "Vishing" where you can actually send your users simulated voice mail attacks?